I'm sure I've mentioned before what a wonderful place Instagram is for us crafty types. 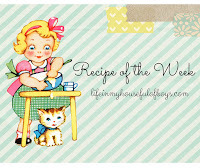 It's full of crafters sharing their makes, ideas and inspirations. Yes, it's also full of a lot of selfies and duck faces, but the people I follow aren't into that side of the site, thankfully! 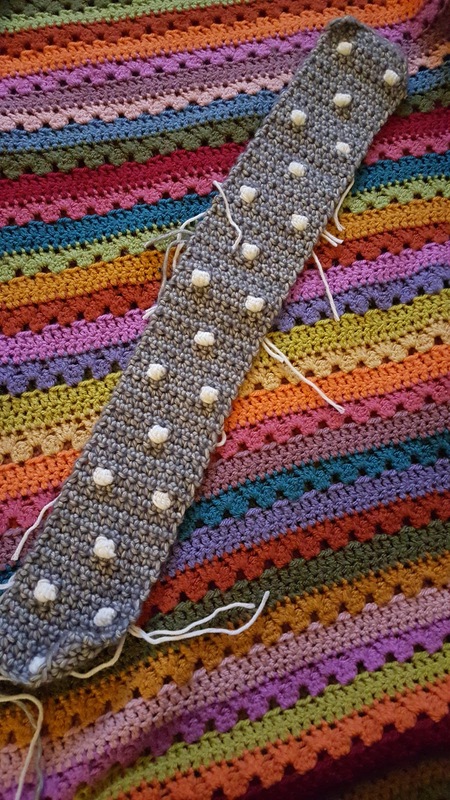 My Instagram friends share photos of their crochet, knitting, baking, families, day to day lives and a bit more crochet. 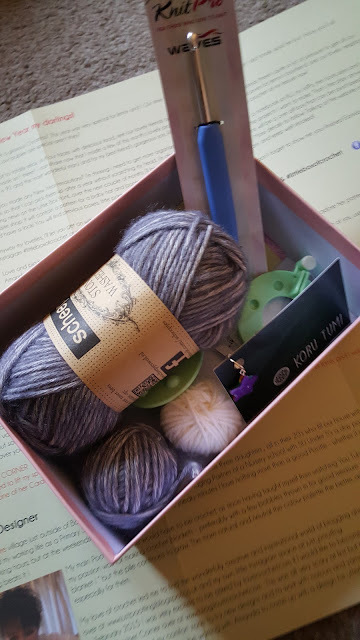 It was there I first heard about the Little Box of Crochet, a monthly subscription box containing everything you need for a crochet project. I've seen quite a few of these sort of monthly subscription boxes around. Some are aimed at crafts for kids, others at home cooks, but this was the first one I had seen for crocheters. 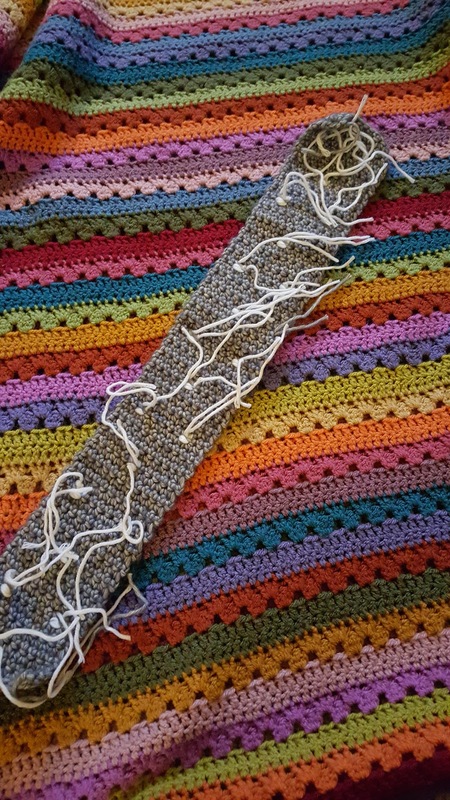 It seemed like something I would love but as it was just before Christmas I had more than enough to do without adding a new project and so I decided not to subscribe quite yet. Soon people began sharing pictures of their first boxes and then the second, which contained everything needed to make a beautiful pair of wrist warmers, and by the time the January box came out I had decided that, yes, this would be a perfect little treat for me. The trouble was that by then the subscriptions were all full! Thankfully a few more slots were released a couple of weeks later and I was fortunate to get one of these. A couple of days later and I received my happy post, on a day that Bob the Builder and his gang were busy fixing things. The box was even more beautiful than I had imagined, a really high quality sturdy box that I am already imagining putting to good use as a craft supply storer! Once I delved into the box there was everything needed to make the ear-warmer - gloriously soft scheepjes yarn (a yarn I have never used before but will definitely use again), a knit pro waves soft handled crochet hook, stitch marker, pom pom maker, and even a little tea bag so that you can enjoy a cuppa while crocheting. There was also the pattern for the ear-warmers, which was designined by Kate from Just Pootling, and a little newsletter from Amanda, the lovely lady behind Little Box of Crochet. 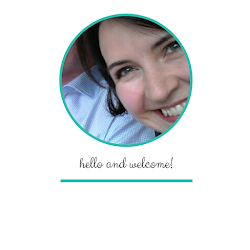 The pattern was really straightforward and easy to get into the swing of. Look at those cute little pom pom stitches. I completed the different parts of the ear-warmer over the weekend. But still need to sew in those ends before assembling it! 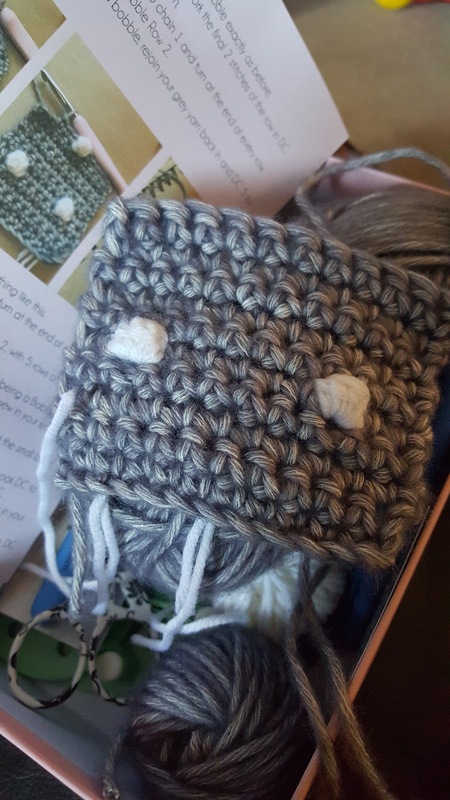 You can see how the finished ear-warmer is meant to look, and find out more about the boxes on the Little Box of Crochet website. 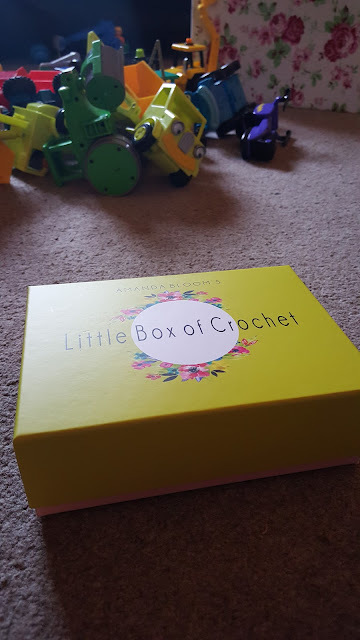 I wasn't asked to write a review about these boxes, but just thought they were so lovely that I thought I would share them with you all, especially as I know that there are quite a few of you who are fellow crocheters. Based on how well the pattern in this box was explained I think even a beginner could successfully have a go too, after all everything you need is in the box, so if you've always fancied giving it a go then why not?! The price is really reasonable, and since I rarely treat myself I see it as a little bit of 'me-time' in my schedule. You can also buy subscriptions as gifts so if you don't crochet yourself but know of anyone who loves crochet then I'm pretty sure they would be absolutely delighted with this. 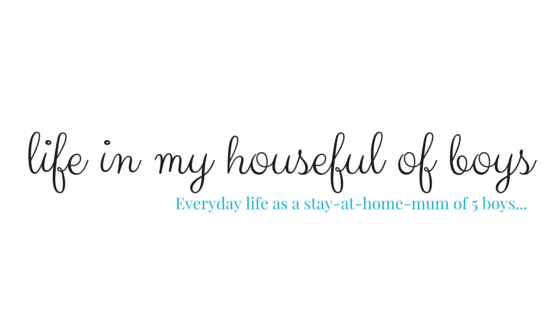 I think subscriptions are full again for now as Amanda has just moved house but she has said that she is hoping to open up some more very soon. Oh, and if you are out-with the UK then don't worry as the boxes are now available worldwide too! Now, time to sort out all those ends! I would love to see the finished ear warmers! And, I'm curious about the beautiful, colorful Afghan in your photos. Did you make that as well? I'll share a picture of the finished ear warmers this week!